The Ontario Hamster Club (OHC) was formed in early 2016, in a response to the lack of agreed upon guidelines regarding the care of hamsters in Ontario. Unlike the UK, which is benefited by the National Hamster Council, most of North America exists without a large governing body. The OHC is a member of The Hamster Club which is a North American club that will be created to unify the fancy. Ontario Hamster Club operates as a Non-For-Profit (NFP) organization, with any funds raised being put back into the organization, or donated to an animal-related charity. The OHC meets regularly for scheduled luncheons and will be holding Hamster Shows in the spring of 2018. Web content and articles produced by our members are vital to the organization. There is a heavy focus on the community in our Facebook Group, which provides a place for owners, rescues and breeders to collaborate and provide support to each other when needed. We like to think of ourselves as a family! The main mission of OHC is education about proper care, and an improvement in the quality of hamsters produced. OHC exists to benefit hamsters of all species, and their owners, by providing a cohesive set of guidelines outlining care. OHC is a non-profit organization that connects hamster owners, lovers, enthusiasts, and breeders, through shared knowledge, and strives to educate the public on proper care and ethics for hamsters. OHC sees a future where hamsters are treated as more than just a child’s first pet. 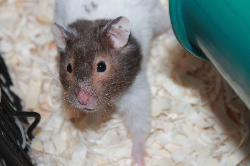 Hamsters are a fantastic pet for any age, but like any animal require specific care. OHC provides a community of like-minded individuals who support each other. Education and support is to be provided to public and members alike to increase the quality of care for all species of hamsters in Ontario, and in Canada. OHC hopes that through its teaching, current and future hamster owners will strive to provide the best possible care for the hamsters.